What is an Indian Roller? The Indian Roller is a pretty bird belonging to the roller family of birds. Known by the name of ‘Blue Jay’ in former times, the brilliance of the color and beauty of the Indian Roller is captivating in every way. Its English name has been inspired by the startling aerobatic display the bird performs in the breeding season. 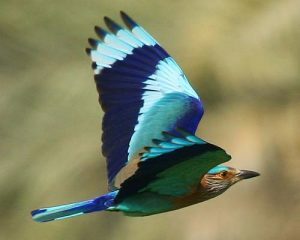 The Indian Roller is found in many regions of the world. The Indian Roller does not come under the list of migratory birds. Several states in India including Karnataka, Andhra Pradesh, Bihar and Orissa have chosen it as their state symbol. One can identify the Indian Roller as a stocky bird that is fairly medium sized with an overall drab brown appearance whilst perched. The bird is approximately 26-27 cm long. It is important to remember that both male and female Indian Rollers look alike. The Indian Roller acquires its name from the striking aerobatics it displays as an act of courtship. Its crown and vent have a distinguished blue color. The dominance of the brown color is what helps to differentiate the Indian Roller from the European Roller which otherwise bears a close resemblance to it. In flight, the Indian Roller flaunts the brilliant combination of colors on its feathers. This beautiful bird has a mesmerizing sky blue colored tail with a hint of Prussian blue color. The feathers towards the centre have a dull green tint. Its throat and neck is noted to be purplish lilac in color with dash of white streaks. The deep color of the grayish brown eyes of the Indian Roller compliments its beauty. Its blackish brown bill has a hooked tip. You may often spot the Indian Roller bird perched or resting upon bare branches of trees. Sometimes these birds are also seen perched on wires in cities and urban areas. It is quite rare for the Indian Roller to fly in groups. However they do have family groups and are observed to communicate with each other in ‘chack’ calls or sounds. The ‘chack’ sound is also associated with crows. Apart from this harsh call the Indian roller also produces metallic boink sounds. An Indian Roller’s version of bathing involves direct dives into water, usually from a high altitude or height. Earlier this act of the Indian Roller was assumed as fishing. Indian rollers are prey birds. They capture and feed upon their prey by descending to the ground. All kinds of insects, reptiles, moths and sometimes even frogs usually end up becoming the bird’s prey. It is also interesting to note how the feeding style and habitat of the Indian roller is similar to the Black Drongo. These birds are also observed to feed late in the evening time during the hot summer months. In the cultivated areas of Southern India, these birds can be found in a ratio of approximately fifty birds per square kilometer. The Indian roller usually prefers to alight on a 3-10 meter high perch. Unfortunately many rollers become victims of traffic collisions since they often tend to feed near roadsides taking aid of street lights at night. The Indian roller is significant for its aerobatic display that has earned the bird its former English name. Whilst in a perched position, the Indian roller performs displays like wing drooping, bowing and tail fanning. These birds prefer to build their nests in tree holes or places similar to it which may also include cavities in tall buildings. They use the remains or bits of wood to build their nests. Listed below are certain important facts about the Indian Roller. It belongs to the Coraciidae family. The Indian Roller bird weighs 90 grams. Both sexes of this particular type of birds look alike; both male and female participate in incubation. The male Indian Roller is known for its unique and startling sexual display which it performs during the breeding season. During the course of the display the Indian Roller bird flies high up in the sky and descends downwards in a circular motion, flapping its winds rapidly. It also produces harsh chack sounds during the act. Many states in India have made the Indian Roller their state bird. The Indian roller is considered to be a sacred bird in Hindu mythology and is associated with the deity Lord Shiva. 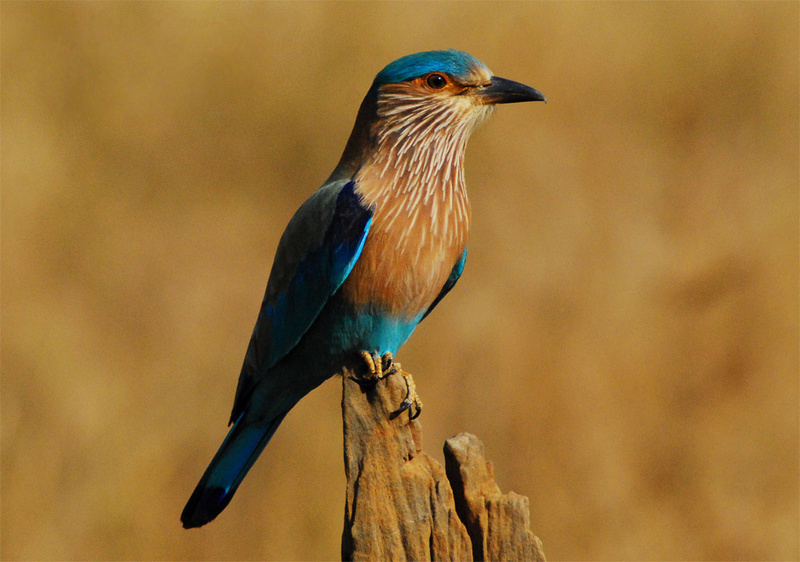 The species of the Indian Roller bird does not face the threat of extinction. It is not an endangered species. Frogs top the favorites’ list when it comes to the Indian Roller’s diet. Besides frogs the bird also feeds upon all kinds of insects including crickets, grasshoppers, moths, butterflies and wasps. 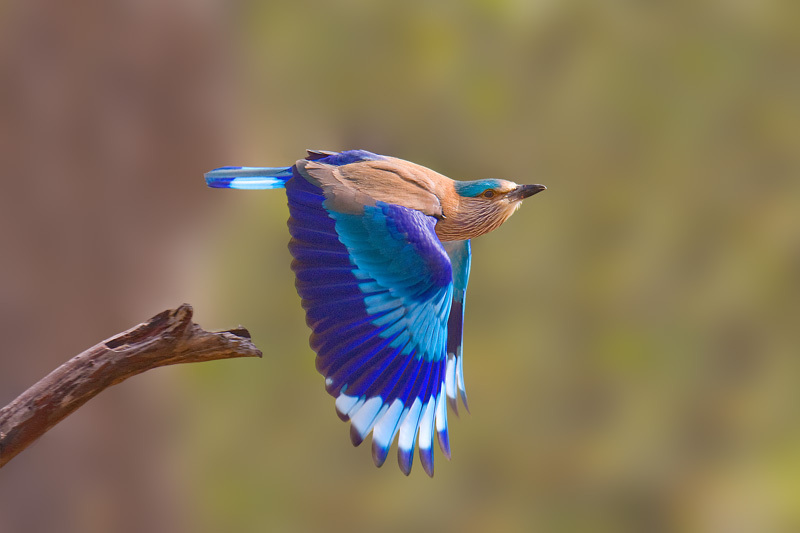 The Indian Roller is usually found in areas of thin deciduous forests and grasslands. This bird also dwells in wide open cultivated areas. However you may often spot the Indian Roller perched in parks and electric wires of urban cities. The three recognized subspecies of the Indian roller are as follows. Regions of eastern Arabia and north eastern India are inhabited by the ‘benghalensis’ Indian roller. This particular subspecies inhabits regions like India and Sri Lanka. The subspecies under affinis are generally found in North-eastern India, south-central China, Indochina and Northern Malay Peninsual. These birds are found to be darker and bigger in size. The absence of streaks on the face and breast is evident. Its face has a purplish brown tint. The European roller and Dollar bird are the other two species of the Indian Roller. The Indian roller and the European roller bear a very close resemblance. However unlike the Indian rollers, the European rollers are migratory birds and have a blue breast. The dollar bird is an oriental bird that belongs to the roller family. It can be easily identified due to the round coin shaped spots on its blue wings. The Indian Roller oriental bird images can be found in many websites. The Indian roller has a lifespan which extends upto seventeen years. The Indian Roller is dominantly found in the continent of South Asia and certain parts of West Asia. As suggested by its name, it is obviously found in the country of India. The Lashadweep, Maldive Islands and Sri Lanka are also areas inhabited by the Indian Roller. This bird is also found further west in countries like Iraq and Saudi Arabia. The breeding season of the Indian Roller begins in the early summers just after spring. The startling courtship displays by the males become evident right from the month of February itself. During this interesting display the male Indian Roller flies high up in the sky and returns back down towards the earth surface in a rotating motion, while flapping its wings rapidly and producing harsh sounds. April is the month when the bird lays eggs in tree holes or other similar places. The incubation period for the eggs last for a maximum of 20 days. The eggs are incubated by both male and female Indian rollers. These birds rarely fly in groups. The young birds begin to acquire their flight feathers after approximately 35 days. Anyone who will look at the Indian Roller bird photos for the first time will be captivated by its beauty.